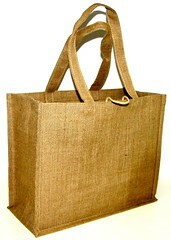 This bag is the cheapest way to get into a Jute Bag, it's made from sturdy Jute fabric with the added bonus of vegetable starch. 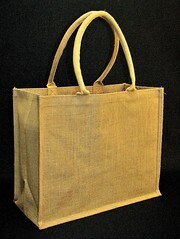 Adding the vegetable starch to the Jute fabric stiffens the fabric & assist the bag be self supporting (whereby it will stand-up on it's own); very handy at the shops with now need to hold it up to load your items in. This has the same wonderful look & feel of Jute as the Basic version does, but the Jute fabric is laminated on the inside with a thin film of polypropylene. This thin film has 2 advantages, first to stiffen the fabric so the bag is self supporting & also the lamination creates a moisture barrier to the fabric. Which means if there is a small liquid spill or condensation build up with the items in the bag, the actual Jute fabric is protected by the lamination & the likelihood of the fabric becoming moist/wet is very minimal. All the features of the Premium Bag + the addition of the Black Contrast Handles & Gusset. A wonderful way to enhance your brand. All these bags are now in stock & can be printed & delivered within 2 weeks. Contact Us to arrange your samples. 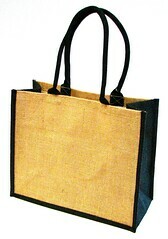 I have used promotional bags for my business and seen a great increase in sales because of them. You have to give them something that they will KEEP and hopefully look at when they are looking to make a purchase decision.